Soap operas have long lived off far-fetched, outlandish plots and storylines, but very few have reached the heights of the John Stape/Colin Fishwick saga, which looks like it’s about to reach it’s conclusion in some special episodes set to air over the coming few days on ITV. Through a long line of bad luck, bad choices, and bad behaviour, the story of John Stape becoming the “accidental serial killer” of the street has turned in to one of the best ever to grace the cobbles, full of black humour, farce, and surprisingly, a great deal of empathy for the character and his situation. In episodes that will air next week after the 9.00pm watershed due to a schedule clash with Britain’s Got Talent, ITV are promising something especially dramatic for his long running saga to go out on, culminating on Friday June 3rd. I’ll admit, when this storyline began all that time ago, I did raise the odd eyebrow at some of it’s more unbelievable aspects, but it’s really grown into something far better, especially alongside the dramatic turn of events during the show’s 50th anniversary episodes last December. The accidental killing of the obsessed and unbalanced Charlotte Hoyle, and those moments just after as John began dialling the police to confess his crime(s) moments before the tram came crashing down on the street were brilliantly played, and directed, and are I think where the sympathy for his plight finally surfaced. All he wants to do is be husband, and father, but events keep getting in the way. John Stape was a secondary school teacher whilst in a relationship with childhood sweetheart Fiz, and then embarks on an affair with one of it’s pupils, Rosie Webster, who is only sixteen at the time. The affair finishes after they are found out, but a few months later in an unstable state of mind, he takes Rosie ‘hostage’ and locks her up in the loft of his grandmother (who has recently died). When she eventually escapes her captor, Fiz ends the relationship, and John is arrested and eventually sentenced to two years in prison. Following so far? It’s hardly gotten started…. Fiz decides she still loves him, and starts to visit him in prison. When finally released, she takes him back and he returns to live on the street with her, and after a difficult time persuading fellow residents to accept him back into the community, things start to look more rosy for him. However, he still longs to teach again, but can’t due to his previous actions and conviction. After a chance occurence at a party from fellow teachers he used to work with, he discovers that one of them, Colin Fishwick, has decided to emigrate. The idea to assume his identity, and get himself another teaching job is born, and sets him on the grim path he is now nearing the end of. Nothing could go wrong with such a great plan, could it? When his false identity is discovered by fellow teacher Charlotte Hoyle at a teacher’s conference, she becomes obsessed and infatuated with his double life, and tries to blackmail him into sleeping with her. However when the real Colin returns to the street to uncover what’s been going on, she helps John attempt to explain his motives and actions. This is where the bad luck steps up a couple of gears, and the real Colin Fishwick collapses dead in John‘s living room after they argue. In the heat of the moment, John and Charlotte decide to dispose of the body underneath the Underworld factory, which is about to be filled in with concrete. Phew, you’d think that would be enough bad luck, wouldn’t you? Charlotte becomes more unstable, and secretly sends John anonymous letters pretending to be from someone who knew what they did to Colin in the hope it will bring them closer together. John wants nothing to do with her really, but she tells him she’ll go to the police if he doesn’t agree to be with her. He begins playing out another double life as Colin Fishwick, this time as Charlotte‘s fiancé, all the time unknown to his wife, Fiz. On the night of the tram crash, after an argument with Charlotte who promises to tell Fiz everything, he accidentally hits her with a hammer after a struggle. He drags her body out to the wreckage in the street, where she is mistakenly thought to be one of the tram crash victims. 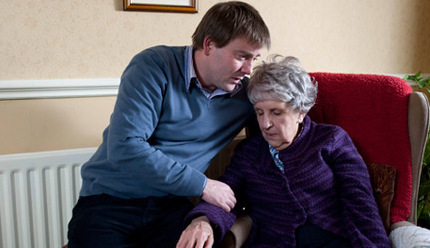 She dies in hospital later, when “Colin” advises her parents to switch off her life support. He becomes wracked with guilt at what he’s done, and befriends Colin Fishwick‘s mum, Joy Fishwick after another chance meeting. Finally in some very hilarious scenes, he confesses everything he’s done, murders, deception, double identities etc., whilst alone with her, as he can’t take all the lies any more. As if art is immitating life, she doesn’t believe him and thinks he’s crazy. Just at this moment a neighbour knocks on her door and John holds his hand over her mouth to stop her calling out. He keeps his hand there too long, and before he realises, she’s dead too. It looks like he’s gotten away with it too, for the moment. Has nervous breakdown. Committed to institution. Whilst there, Joy Fishwick‘s lawyer visits Fiz and tells her that “Colin” will inherit everything, including her house. Struggling to bring up their premature baby Hope, Fiz can’t look a gift horse in the mouth and becomes Mrs. Fishwick and receives the inheritance. John is released from hospital on medication. All’s well for a short while, but events keep coming back to haunt him. Winding to the end, Charlotte‘s parents discover his true identity, and Fiz‘s brother Chesney becomes suspicious that John is still hiding something. John then makes the bright move of locking Chesney and Charlotte‘s parents up in their cellar as hostages too. Although I’m attempting to avoid any spoilers about how this is all going to resolve, things began this week that are obviously going to shape it. When the workers at the Underworld factory were sent home due to a problem with the gutters and drains, it didn’t take too much taxing of the brain to work out that that someone is going to have to dig up the concrete floor where the real Colin is buried. As John tries to convince Fiz that Colin has returned to the country, and that they should move away from the street as quickly as possible to avoid being found out for taking the inheritance, you just know this can’t really turn out well. Whatever the fate lying in store for John Stape, I’m going to miss the character(s), and think that actor Graeme Hawley has played him beautifully. I wish him well in his career and hope he goes on to bigger and better roles. This entry was posted on Wednesday, May 25th, 2011 at 5:13 pm	and is filed under News, TV & Film. You can follow any responses to this entry through the RSS 2.0 feed. You can leave a response, or trackback from your own site.